Docker is a virtualization application that abstracts applications into isolated environments known as containers. The idea behind a container is to provide a unified platform that includes the software tools and dependencies for developing and deploying an application. The traditional way of developing applications is where an application is designed and hosted on a single server. This setup results in a number of problems including the famous “it works on my machine but not on yours”. Also in this architecture, apps are difficult to scale and to migrate resulting in huge costs and slow deployment. 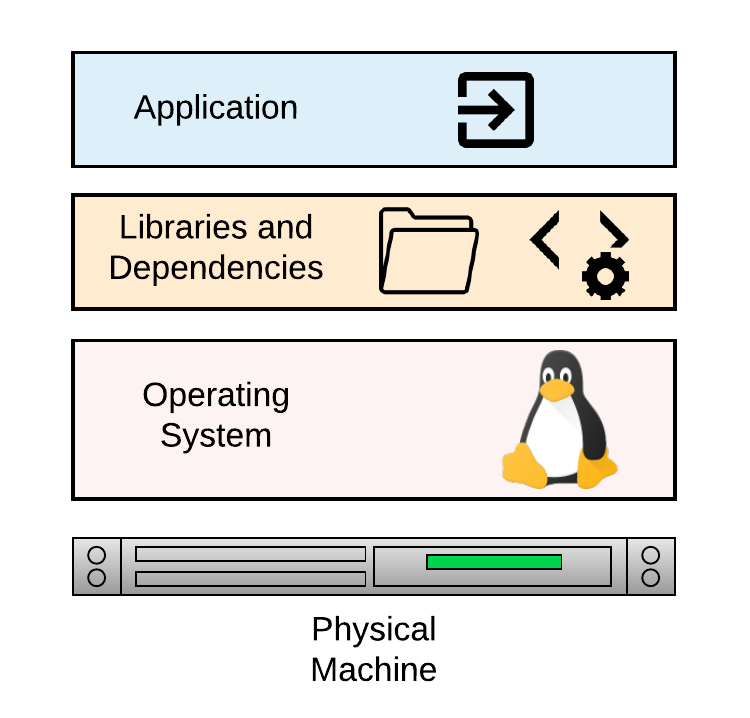 Virtual machines (VMs) emulates the capabilities of a physical machine making it possible to install and run operating systems by using a hypervisor. 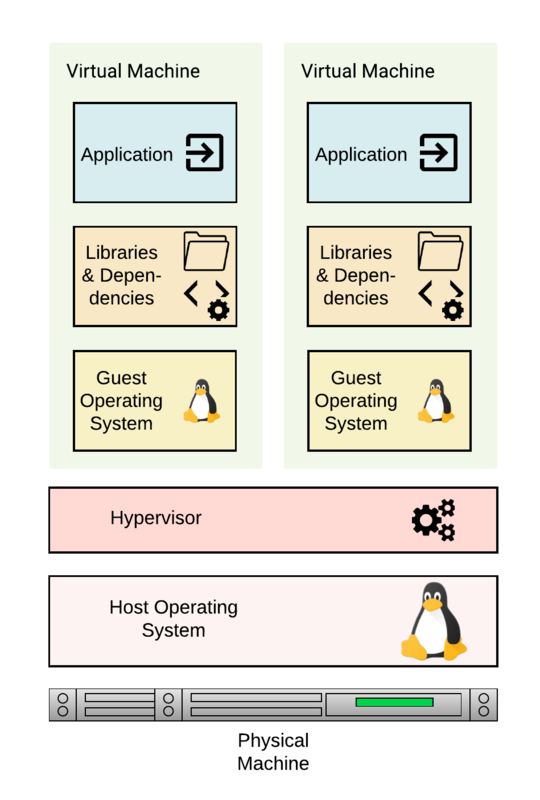 The hypervisor is a piece of software on the physical machine (the host) that makes it possible to carry out virtualization where multiple guest machines are managed by the host machine. 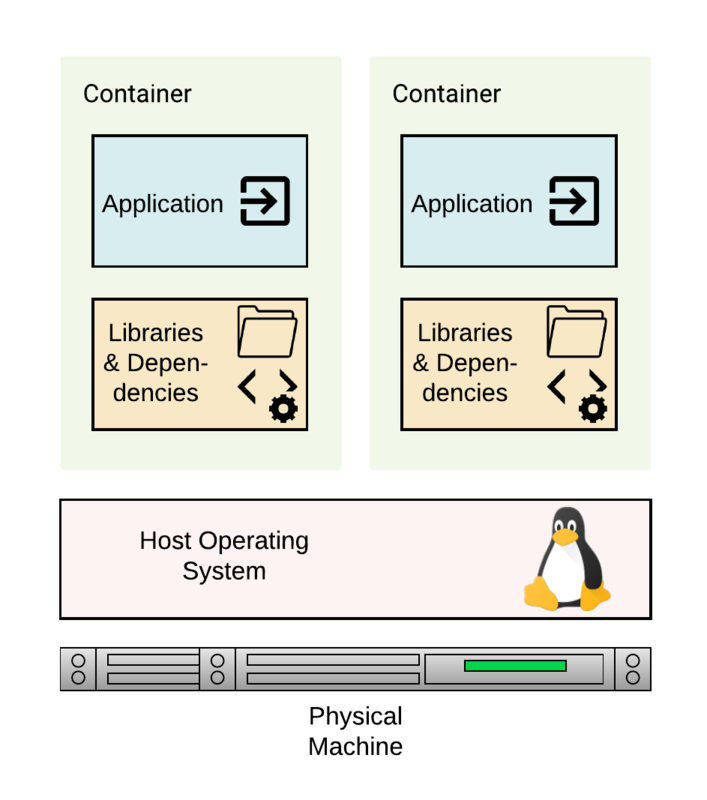 Containers on the other hand isolate the environment for hosting an application with its own libraries and software dependencies, however, as opposed to a VM, containers on a machine all share the same operating system kernel. Docker is an example of a container. Begin by installing Docker software on the local machine to enable it run Docker containers. 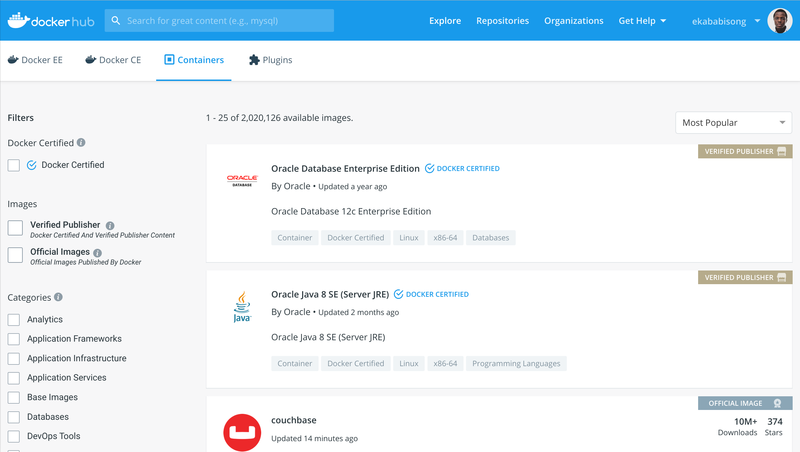 Visit https://www.docker.com/get-started to get started. Dockerfile: A Dockerfile is a text file that specifies how an image will be created. Docker Images: Images are created by building a Dockerfile. Docker Containers: Docker containers is the runnning instance of an image. The diagram below highlights the process to build an image and run a Docker container. DockerHub is a library for hosting Docker images. The following are key routines when creating a Dockerfile. FROM The base Docker image for the Dockerfile. LABEL Key-value pair for specifying image metadata. RUN It execute commands on top of the current image as new layers. COPY Copies files from the local machine to the container filesystem. EXPOSE Exposes runtime ports for the Docker container. CMD Specifies the command to execute when running the container. This command is overridden if another command is specified at runtime. ENTRYPOINT Specifies the command to execute when running the container. Entrypoint commands are not overridden by a command specified at runtime. WORKDIR Set working directory of the container. VOLUME Mount a volume from the local machine filesystem to the Docker container. ARG Set Environment variable as a key-value pair when building the image. ENV Set Environment variable as a key-value pair that will be available in the container after building. In this simple example, we have a bash script titled date-script.sh. The script assigns the current date to a variable and then prints out the date to the console. The Dockerfile will copy the script from the local machine to the docker container filesystem and execute the shell script when running the container. The Dockerfile to build the container is stored in docker-intro/hello-world. Let’s view the bash script. echo "Todays date is $DATE"
The CMD routine executes the script when the container runs. docker build -t ekababisong.org/first_image . Step 2/4 : LABEL maintainer="[email protected]"
docker images List all images on the machine. docker rmi [IMAGE_NAME] Remove the image with name IMAGE_NAME on the machine. docker rmi $(docker images -q) Remove all images from the machine. docker ps List all containers. Append -a to also list containers not running. docker stop [CONTAINER_ID] Gracefully stop the container with [CONTAINER_ID] on the machine. docker kill CONTAINER_ID] Forcefully stop the container with [CONTAINER_ID] on the machine. docker rm [CONTAINER_ID] Remove the container with [CONTAINER_ID] from the machine. docker rm $(docker ps -a -q) Remove all containers from the machine. Let’s breakdown the following command for running a Docker container. -d: run the container in detached mode. This mode runs the container in the background. -it: run in interactive mode, with a terminal session attached. --rm: remove the container when it exits. --name: specify a name for the container. -p: port forwarding from host to the container (i.e. host:container). docker build -t ekababisong.org/nginx_server . Login to Docker and provide your userid and password. Local directories can be mounted as a volume to a running container, instead of the container filesystem itself. With volumes,the data can be shared with the container, while persisted on the local machine. Volumes are attached with the -v label in the docker run command. Now whatever changes is made to the file index.html is immediately seen on the web browser from the nginx server in the Docker container. Note: This image is large and will take a while to pull from Dockerhub. 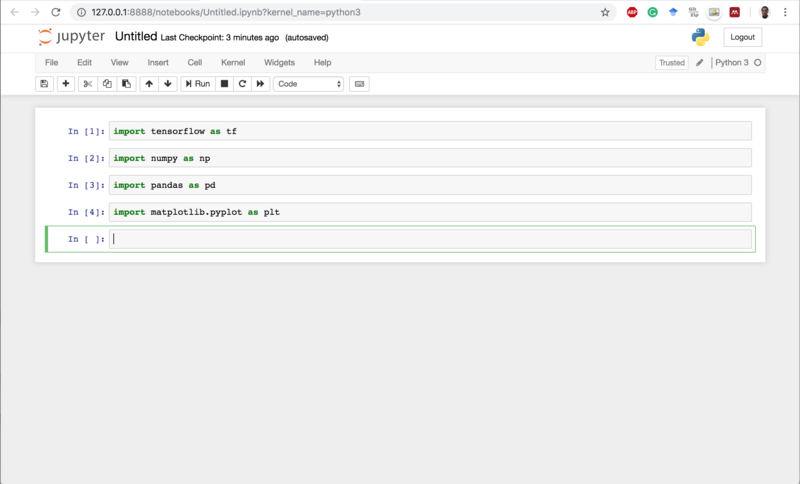 This command starts an ephemeral container running a Jupyter Notebook server and exposes the server on host port 8888. The server logs appear in the terminal. Visiting http://<hostname>:8888/?token=<token> in a browser loads the Jupyter Notebook dashboard page. It is ephemeral, because Docker destroys the container after notebook server exit. This is because of the --rm label in the docker run command. The image below shows a Notebook running from a Docker container. Reclaim the local terminal by pressing control + c.